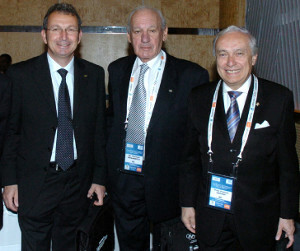 Academy President Dr. Thomas P. Rosandich (middle) with Dr. Franco Ascani (right), President of FICTS, and Professor Konstantino Georgiadis, Honorary Dean of the International Olympic Academy, at the IOC’s 7th World Conference on Sport, Education, and Culture in Durban, South Africa, in 2010. The Fédération Internationale Cinéma Télévision Sportifs (FICTS), which is dedicated to promoting sport culture and Olympic values in sport cinema, television, culture and communication in 108 countries and five continents, appointed United States Sports Academy President and CEO Dr. Thomas P. Rosandich to its Culture, Education and Youth Commission. As a member of the FICTS commission, Dr. Rosandich will be engaged in different international cultural and formative activities on a national and international level that help spread sport culture and Olympic values among the world’s youth. FICTS, which is recognized by the International Olympic Committee (IOC), has a number of programs focused on youth, such as sport competitions in track and field, programs promoting peace through sport and the inclusion of people with disabilities in sport activities, a writing competition on sport and Olympic values, and a showcase of sport art and films. “Sport Movies & TV – International FICTS Fest” is the organization’s largest and best-known event. The six day festival held annually in Milan, Italy, includes the “World FICTS Challenge,” a competition for cinematographic and TV works that come from all over the world, as well as other events highlighted by the presentation of 30 prestigious awards in sport cinema and TV. Dr. Rosandich’s commission appointment by the FICTS executive board comes on the heels of his reappointment last month to the IOC’s Commission for Culture and Olympic Education, which advises the IOC on the promotion of culture and Olympic education and supports the IOC programs and activities related to the education of youth through sport. Dr. Rosandich serves on that 35-member commission along with FICTS President Professor Franco Ascani. Dr. Rosandich, who has served on the IOC commission since its inception in 2000, has been involved in the Olympic Movement for more than 50 years. He received the IOC’s highest award – the Olympic Order – in 1997. He received the highest honor given by the United States Olympic Committee (USOC) in 2000, when he was awarded the USOC’s President’s Medal.